BioForm, Double Leg (1 piece), Non-padded Footboxes, Nuts and Bolts to secure from footplates. BioForm, Double Leg (1 piece), Non-padded Footboxes, Hardware to secure from Hangers. BioForm, Double Leg (1 piece), Non-padded Footboxes, Hardware to secure from Seat Pan. BioForm, Single Leg (2 pieces), Non-padded Footboxes, Nuts and Bolts to secure from footplates. BioForm, Single Leg (2 pieces), Non-padded Footboxes, Hardware to secure from Hangers. BioForm, Single Leg (2 pieces), Non-padded Footboxes, Hardware to secure from Seat Pan. BioForm, Double Leg (1 piece), Padded Footboxes, Nuts and Bolts to secure from footplates. BioForm, Double Leg (1 piece), Padded Footboxes, Hardware to secure from Hangers. BioForm, Double Leg (1 piece), Padded Footboxes, Hardware to secure from Seat Pan. BioForm, Single Leg (2 pieces), Padded Footboxes, Nuts and Bolts to secure from footplates. A "butterfly" style anterior chest support made from Neoprene. Includes 6 side release buckles and belt anchors for easy adjustment and attachment to a solid back. This accessory will be beneficial when the client needs maximum assistance maintaining proper upper trunk position in the wheelchair while benefiting from the elasticity of Neoprene. 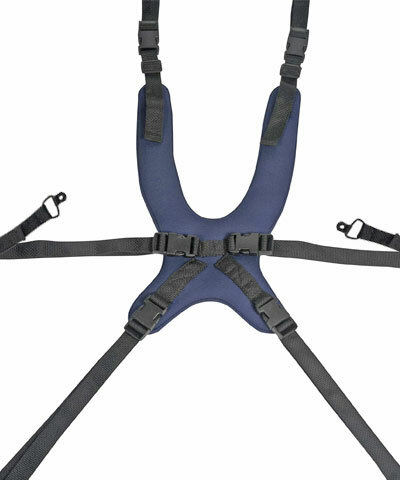 The 6 points of attachment offer a more aggressive harness giving more stability as well as abdominal support. Positioning Belts, Straps and Pads found in this section enhance the positioning of the upper trunk and lower extremities. Many of the Positioning Belts and Straps are available with pads. Those without can be retrofitted with our padded sleeve options. All choices come with the appropriate mounting hardware. The BioForm Line of Anterior Trunk Supports are available in Neoprene (Rubatex), Reverse Dartex, Vinyl (Naugahyde), and Ballistic Nylon. Neoprene is effective when control is needed but a stretch component would prove beneficial. Reverse Dartex will offer a more rigid support than Neoprene while still having some elasticity, as well as providing an easy to clean surface. Vinyl (Naugahyde) will offer the most rigid support as well as a surface which handles fluids and cleanings most easily. Ballistic Nylon is the preferred material when the consumer will try to orally or otherwise try to destroy the harness. All styles below are available in standard sizes from XS through XL. A customization to the size and/or shape is available by selecting the appropriate model #. BioForm Standard Anterior Trunk Supports are an effective way to help maintain a properly positioned trunk when significant assistance is needed. Comes complete with 4 securing straps, end fittings and all mounting hardware. BioForm Anterior Trunk Supports with Snap Closures assist in easier/quicker transfers from the wheelchair. Comes complete with 4 securing straps, end fittings and all mounting hardware. BioForm "H" type Anterior Trunk Supports assist in easier/quicker transfers from the wheelchair. Comes complete with 4 securing straps, end fittings and all mounting hardware. 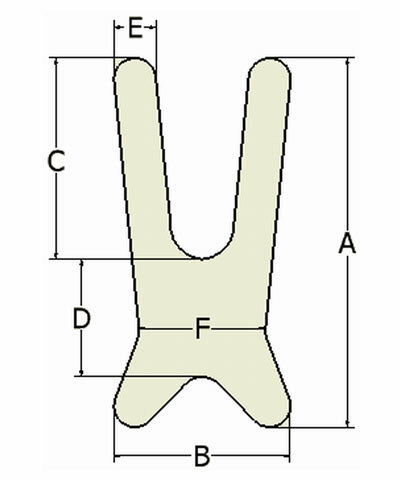 BioForm Low Profile Anterior Trunk Supports are effective when significant assistance is needed to properly maintain upper trunk position and a g-tube needs to be accommodated for. This product may also prove helpful when used with the adolescent to fully matured female shape. Comes complete with 4 securing straps, end fittings and all mounting hardware. BioForm 6 Point Trunk Support is effective for the client who needs maximum trunk support: Anterior Trunk, pelvis and shoulders. Comes complete with 6 securing straps, end fittings and all mounting hardware. If color other than Black Neoprene is desired, replace the last two letters of the model number (NB) with those from Color Selection section. i.e.- NRD-NB becomes NRD-NE when color Eggplant is desired. 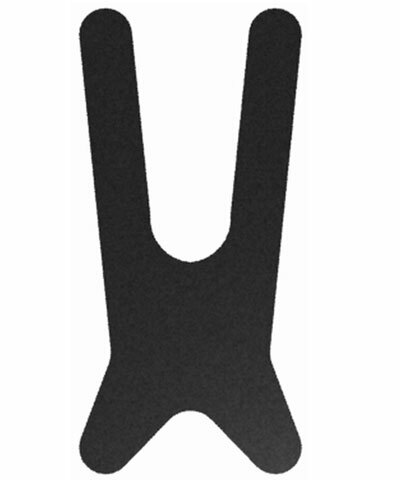 If Harness Guides are desired (to be mounted on a solid back insert), choose selection from section C 3.5.